MYRTLE BEACH, S.C. (September 21, 2018) - In the wake of Hurricane Florence that hit and devastated parts of South Carolina and much of North Carolina over the past week, thirteen Minor League Baseball teams in the two states are coming together to support and raise money for those victims in their states. 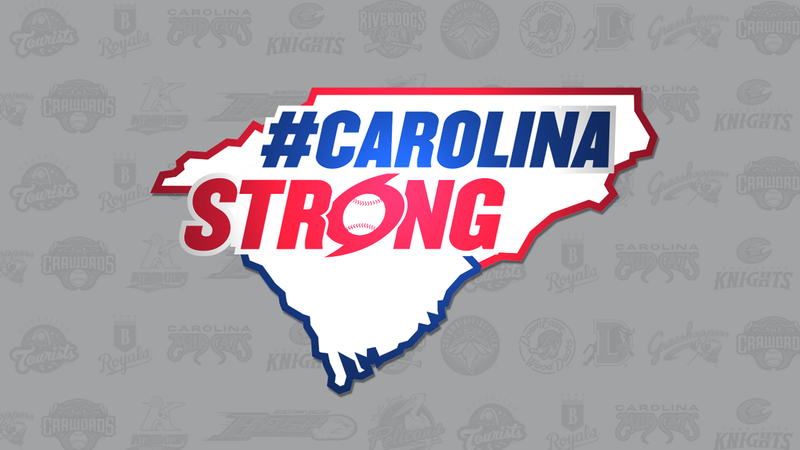 The Asheville Tourists, Burlington Royals, Carolina Mudcats, Charleston RiverDogs, Charlotte Knights, Columbia Fireflies, Down East Wood Ducks, Durham Bulls, Greensboro Grasshoppers, Hickory Crawdads, Kannapolis Intimidators, Myrtle Beach Pelicans and Winston-Salem Dash announced today that they have created a joint GoFundMe page, raising funds for branches of the American Red Cross in affected areas of North Carolina and South Carolina. The thirteen-­‐‑team dual state alliance will work together to maximize fundraising efforts across the state, utilizing the hashtag: #CarolinaStrong. A State of Emergency was issued on September 7 by North Carolina Governor Roy Cooper and on September 8 for South Carolina by Governor Henry McMaster. More than 1 million people were told to evacuate coastal areas in the two states. President Trump declared a State of Emergency in the Carolinas on September 10. A day later FEMA announced that federal emergency aid would be made available. As of Thursday, 37 deaths had been reported due to Florence with 27 confirmed in North Carolina and eight in South Carolina. Both states have received unprecedented rainfall and flooding from a tropical cyclone, and hundreds of miles of roads were closed in each state. North Carolina Department of Public Safety is reminding residents to stay alert for continued flooding, power outages, and downed trees. Though evacuation orders have been lifted for the coastal regions of South Carolina, Florence's aftermath has already begun to flood parts of the state while other areas remain on high alert for flooding in the coming days. Even this morning, Florence County issued a mandatory evacuation for several areas due to severe flooding. "We've seen time and again that the residents of North and South Carolina are strong and resilient. In difficult times we stand by one another and lift up those in need. This time won't be any different," said the General Managers of the 13 MiLB teams in a joint statement. "Our teams are an integral part of the fabric of the community within our respective cities across North and South Carolina. While most days we operate as separate organizations, today we band together to support the citizens of these two great states." Those wishing to contribute can head to the #CarolinaStrong GoFundMe page at the following link: http://bit.ly/GoFundCarolinaStrong. All funds raised through this campaign will be donated to the American Red Cross in affected areas of North Carolina and South Carolina. ABOUT THE ASHEVILLE TOURISTS: They are the Class A-Advanced affiliate of the Colorado Rockies and play their home games at McCormick Field in Asheville, North Carolina. Their General Manager is Larry Hawkins. For more information on the Tourists please call (828) 258-0428. ABOUT THE BURLINGTON ROYALS: They are the Rookie affiliate of the Kansas City Royals and play their home games at Burlington Athletic Stadium in Burlington, North Carolina. Their General Manager is Mikie Morrison. For more information please call (336) 222-0223. ABOUT THE CAROLINA MUDCATS: They are the Class A-Advanced affiliate of the Milwaukee Brewers and play their home games at Five County Stadium in Zebulon, North Carolina. Their General Manager is Joe Kremer. For more information please call (919) 269-2278. ABOUT THE CHARLESTON RIVERDOGS: They are the Class A affiliate of the New York Yankees and play their home games at Joseph P. Riley, Jr. Park in Charleston, South Carolina. Their General Manager is Dave Echols. For more information please call (843) 723-7241. ABOUT THE CHARLOTTE KNIGHTS: They are the Class AAA affiliate of the Chicago White Sox and play their home games at BB&T Ballpark in Charlotte, North Carolina. Their General Manager is Rob Egan. For more information please call (704) 274-8300. ABOUT THE COLUMBIA FIREFLIES: They are the Class A affiliate of the New York Mets and play their home games at Spirit Communications Park in Columbia, South Carolina. Their President is John Katz. For more information please call (803) 726-4487. ABOUT THE DOWN EAST WOOD DUCKS: They are the Class A-Advanced affiliate of the Texas Rangers and play their home games at Grainger Stadium in Kinston, North Carolina. Their General Manager is Wade Howell. For more information please call (252) 686-5172. ABOUT THE DURHAM BULLS: They are the Class AAA affiliate of the Tampa Bay Rays and play their home games at Durham Bulls Athletic Park in Durham, North Carolina. Their Vice President-Baseball Operations is Mike Birling. For more information please call (919) 687-6500. ABOUT THE GREENSBORO GRASSHOPPERS: They are the Class A affiliate of the Miami Marlins and play their home games at First National Bank Field in Greensboro, North Carolina. Their Vice President of Baseball Operations is Katie Dannemiller. For more information please call (336) 268-2255. ABOUT THE HICKORY CRAWDADS: They are the Class A affiliate of the Texas Rangers and play their home games at L.P. Frans Stadium in Hickory, North Carolina. Their General Manager is Mark Seaman. For more information please call (828) 332-3000. ABOUT THE KANNAOPLIS INTIMIDATORS: They are the Class A affiliate of the Chicago White Sox and play their home games at Intimidators Stadium in Kannapolis, North Carolina. Their President/General Manager is Brian Radle. For more information please call (704) 932-3267. ABOUT THE MYRTLE BEACH PELICANS: They are the Class A-Advanced affiliate of the Chicago Cubs and play their home games at TicketReturn.Com Field at Pelicans Ballpark in Myrtle Beach, South Carolina. Their General Manager is Ryan Moore. For more information please call (843) 918-6000. ABOUT THE WINSTON-SALEM DASH: They are the Class A-Advanced affiliate of the Chicago White Sox and play their home games at BB&T Ballpark in Winston-Salem, North Carolina. Their Vice President of Baseball Operations is Ryan Manuel. For more information please call (336) 714-2287.